Get an instant blast to the BIGGEST Social Media Pages Groups, Communities and more instantly as and when you need it, as many times as you want any time! 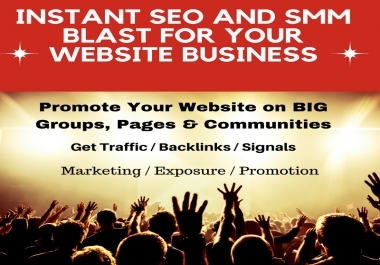 We will do an Instant SEO and SMM Promotion Blast for Your Website Business Video or Anything to all the biggest and best places where your targeted audience can be found today! We know SEO and we're a friend for your SMM! We are joined to the biggest Social Media Groups and Communities and will post your website or blog or video or anything to them for you. And do more! Just check out our amazing extras below when ordering..
We've been providing SEO and SMM for a long time and have a resource pool of many quality VA's and owners of some very big accounts, profiles, pages & groups and more on Facebook Twitter Pinterest G+ and more. We will post and promote your site or message or anything you want on them for you and then provide all the live links in a simple report for you. High Quality Niche Related Social Media Promotion for a very great price! We will build you high quality highly relevant Social Media backlinks from the biggest most highest authority social media sites. Since Google puts so much emphasis on relevancy today Social Media post backlinks from Pages and Groups etc are worth their weight on gold so you don't want to go without them! What is What You Will Get Done for You Exactly? For those that don't know what these are or why you might need them here's a breakdown of each thing we do for you in this service so you'll know exactly what you're getting and why you should get it! We will tweet your site from our own big Twitter accounts and add a bunch of retweets to them for you. Simple as that! We can use #hashtags in your Tweets which will help you to rank higher for them in Twitter & Google. We use old/aged accounts and some may be in your niche. Get top PR9 Twitter backlinks and signals from authority accounts. We will actively search and identify Fan Pages that are related to YOUR niche and post "visitor messages" to them. The followers of those pages will see your posts and they are all publicly indexed and visible in Google Search Results. We are already joined to many hundreds of groups on the biggest and king of all Social Media sites and will post your message/video/url etc to them. All of the groups followers can see your posts and many are also publicly indexed in Google. Whoever said Google+ was dead hasn't looked at the size of some of the biggest Google+ Communities that we post to! Plus since these are highly related to YOUR niche the response and engagement rate can be quite good and they're great for SEO since its backlinks & signals direct from Google. All communities are publicly indexed by Google. 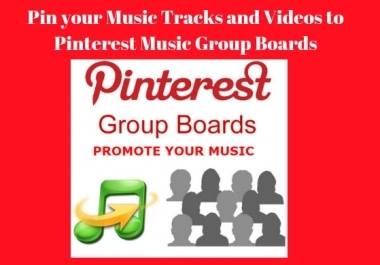 I'm an owner of many hundreds of big Pinterest Group Boards that have millions or users and followers collectively. And will pin your website to them for you. Depending on your niche some of them could be super related to your niche too. Got nice images? 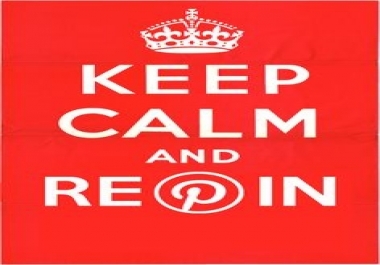 Get direct traffic from Pinterest and pins that rank high and have a lot of ranking clout. Like it says we will socially bookmark your site to a handful of the top and biggest social media sites like Reddit/SU/Digg/Buffer etc etc. We'll randomly submit to the best Social Bookmark site based on your site. 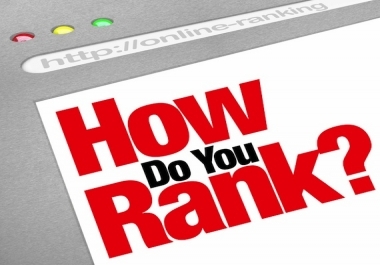 Creating highly coveted rank improving social bookmarks. Videos - Peoples favorite thing is to watch videos! Anything! That's the beauty of social media marketing if there's a demand for it, it goes! 100% real genuine people posting YOUR message using our own accounts. Old and aged accounts used some with many followers. Only the biggest Pages, Groups & Communities posted to in YOUR niche. 100% real social traffic funnelled to your site from the top 10 Social Media sites with great value. 100% Google Adsense and network publisher safe etc. 100% Penguin, Panda, Hummingbird, and Fred safe. Drives Direct Traffic and Builds Trust & Authority to your site. An all-in-one SMM service that keeps on giving! Professional Level 3X SEO and SMM expert. *The the time it takes to complete the standard service it can be done in a day. All the work can be completed within a a day if not busy but please give me up to 3 days at least to complete it all when busy. Longer time with extras of course. For just the basic service just 1 URL per campaign. If you order with extras though we'll be able to use more URLs and promote other products/pages etc on your site/etc etc. Yes you'll get a full free report including live links to all of your posts/tweets, pins etc as soon as the work is all completed when we deliver it to you. Yes, we fully guarantee to complete all of your work as advertised. We can't guarantee any sales/signups and or traffic as we have no control over what people like on Social Media. But we can guarantee the service. Order now from just $7, $9, $11? 14. Get an instant and generous Social Media blast for a super great low price! Just a promotional price for the first 20 buyers! Check out our super great Extras to get more bang for your buck!